Urgent Care - InterMed, P.A. Urgent Care has moved to a new location, 50 Foden Road. InterMed Urgent Care is available by appointment only to InterMed patients from 7 a.m. to 7 p.m., seven days a week. Closed Thanksgiving and Christmas. Our Urgent Care is staffed by emergency medicine trained, board-certified physicians, and a team of support staff ready to meet your acute care needs. 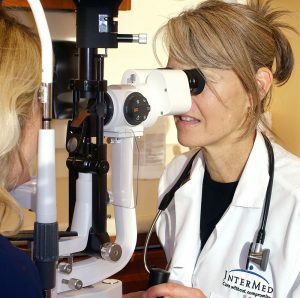 With direct access to the full spectrum of imaging and laboratory services, InterMed Urgent Care has advanced diagnostic services that other area urgent care service providers don’t. Watch the Urgent Care video!Our physicians have direct access to your medical record so the care you receive at InterMed Urgent Care will take your complete medical history into consideration. Why wait in a community based urgent care center or an emergency department — call us and schedule an Urgent Care visit at InterMed Urgent Care instead. We will provide the excellent, patient centered care you expect from InterMed. Hours are 7:00 a.m.–7:00 p.m., 7 days a week. Lab, CT, and X-ray available.